Well, I’ve officially made it to 36 weeks pregnant which is considered 9 months! I still have about three and a half weeks before my official due date and I’m not so secretly hoping he stays in as long as possible. Just not too much over, ok? 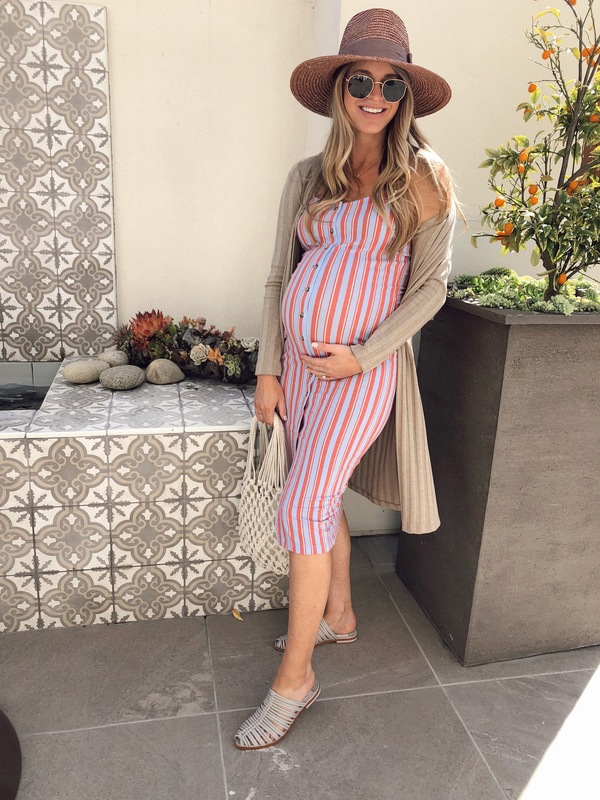 It’s been awhile since I gave a pregnancy update… and with the days dwindling by, I figured it’s time! First of all, it is absolutely wild seeing your body transform, basically overnight. Even though I’ve been through this before, I’m still amazed at what our bodies are capable of. I’ve been taking bump shots and put them all together below. So crazy! The big reason I’m not hoping for him to make an appearance yet is that I just don’t feel ready at all! I know no one really ever feels ready, but I think I felt more prepared before I gave birth to Crosby. We’ve made a lot of progress on his nursery but it’s still not complete. We’re waiting on a backordered rug, mattress, and changing pad, and still need new curtains for the room. He won’t even be sleeping in his nursery for a few months but I want it to be ready before. There’s no way I’ll have the energy to finish it once he’s here. I started packing my hospital bag last week and I’d say it’s about 75% packed. I’m planning to do a post on what I packed for the hospital and will share that during my mini “maternity leave.” That’s another thing I prepped for last time! I wrote out several weeks worth of blog posts so that I could have some down time. I really need to step it up! Overall, I’ve been feeling fine but I am a little uncomfortable at this point. My belly is so big it feels like I’m carrying a 10 pound bowling ball around all day. By the night time, I’m exhausted but can’t get comfortable to sleep. And then, when I do fall asleep, I wake up pretty often to go to the bathroom. It totally sounds like I’m complaining a lot, but I am super grateful to have a healthy pregnancy. Another crazy thing are the Braxton Hicks contractions. I think I had them a little with Crosby but really didn’t know what they were. I swear the second time around you feel everything stronger and more frequently. I get them pretty often at night and off and on throughout the day. They usually come on more when I’ve been active with Crosby (picking her up a lot, after ballet and gym class, etc). That’s basically it for an update! As always, thank you for reading and following.